The California Department of Corrections (CDC) has unveiled a new billboard campaign to support U.S. military personnel serving at the Guantanamo Bay detention facility. the CDC successfully apprehended and rehabilitated a San Francisco billboard between Potrero Avenue and U.S. Highway 101, near 19th Street. The CDC released the corrected ad to support our colleagues in the U.S. military who have recently come under scrutiny for their practices at Guantanamo Bay. 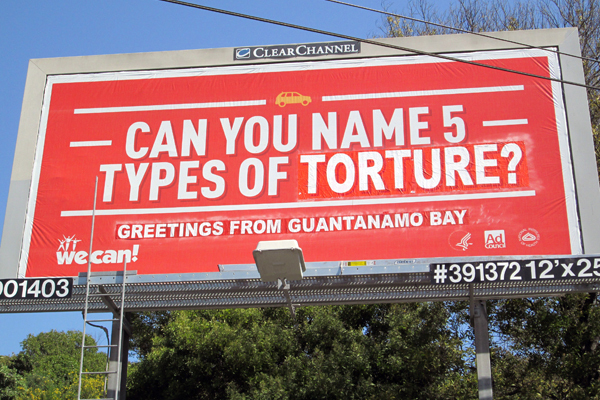 The CDC’s red and white billboard asks in larger-than-life type, CAN YOU NAME 5 TYPES OF TORTURE? Fine-print text responds, WE CAN…GREETINGS FROM GUANTANAMO BAY. The liberated ad can be seen on the CDC website at www.CorrectionsDepartment.org. As a private correctional institution, the CDC recognizes the challenges faced by U.S. military personnel in the efficient maintenance and administration of prison facilities under disruptive conditions. More than half of Guantanamo detainees are currently on hunger strike to protest their open-ended detention without trial or charges. Initiated on February 6, 2013, the protest was sparked by a search of Korans and other inmate belongings, which were mishandled, according to detainees. The rapidly escalating strike now involves 84 of 166 detainees. Six detainees have been hospitalized while 16 others are being force-fed with tubes threaded through their noses and into their stomachs. With limited medical personnel on duty at Guantanamo, the U.S. military is rushing dozens of supplemental staff to the detention facility. The CDC commends the sacrifices made by these doctors, nurses and medics in response to the crisis at the U.S. Naval Base. Force-feeding creates stressful conditions for overtaxed medical personnel who are now obligated to perform additional responsibilities, reducing time for their previous duties, such as coerced, unnecessary operations and the disclosure of confidential medical records with interrogators. Force-feeding also creates dangerous working conditions for military police officers in the Immediate Reaction Force, who must subdue and restrain a detainee prior to his meal. Such burdens exacerbate potential threats to officer safety, which include the risk of ankle sprains incurred while jumping on detainees, repetitive stress injuries from throwing bound inmates into walls or respiratory complications from pepper spray and caustic agents doused over shackled inmates. Upon taking office in 2009, President Obama declared his intention to close the detention facility at Guantanamo Bay. Despite a limited number of detainee transfers out of the prison, no action has been taken to shut the facility, leaving camp personnel with the prospect of supervising uncooperative detainees indefinitely. The corrected billboard is currently at liberty and seems to have successfully readjusted to public life. However, this ad will remain under surveillance by department staff to prevent recidivism and any potential lapse into prior criminal behavior. Founded in 1994, the CDC is a private correctional facility that protects the public through the secure management, discipline and rehabilitation of California's advertising. The department was initiated by individuals who felt that public correctional facilities were insufficiently managing the state's most criminal elements and that effective care and treatment would improve under the supervision of a private institution. For more information on the department’s operations and programs, contact the CDC Office of Communications at cdc@revolutionist.com.